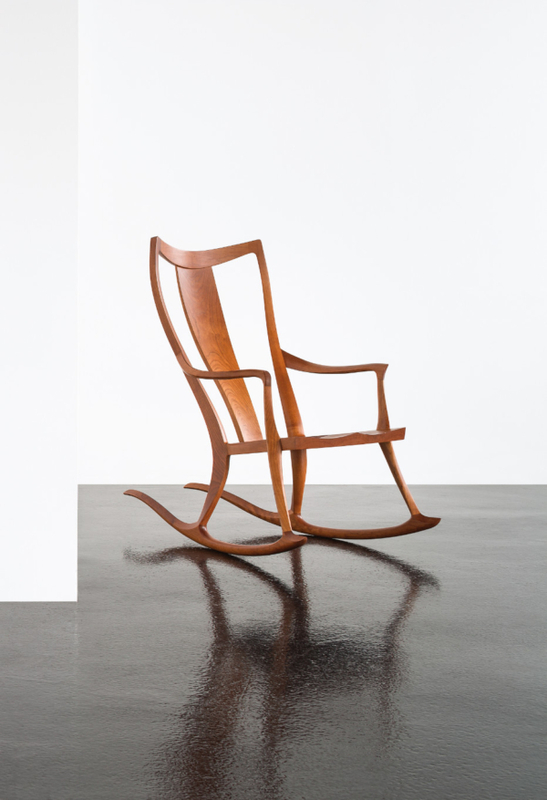 In his designing of the Pasadena Rocker, David Moser employed a sculptor’s eye, envisioning the piece as a singular form, rather than a series of components. 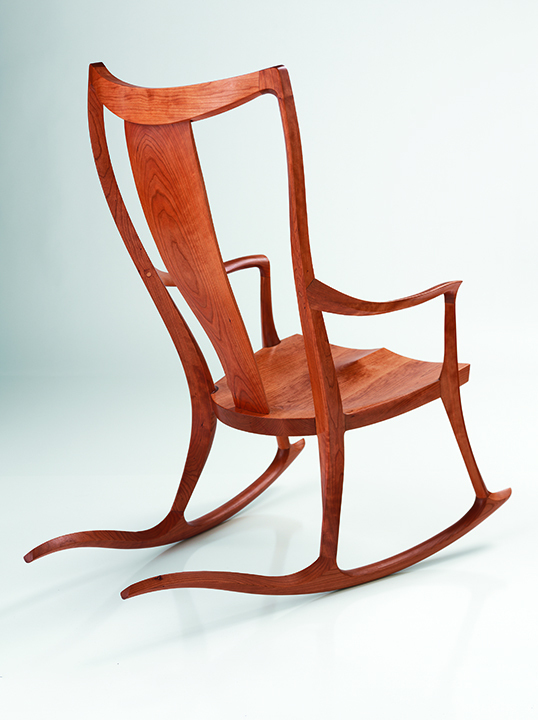 The rocker is the progeny of a long line of high craft designers builders, including Sam Maloof, Wharton Esherick and New Zealand furniture designer David Haig. 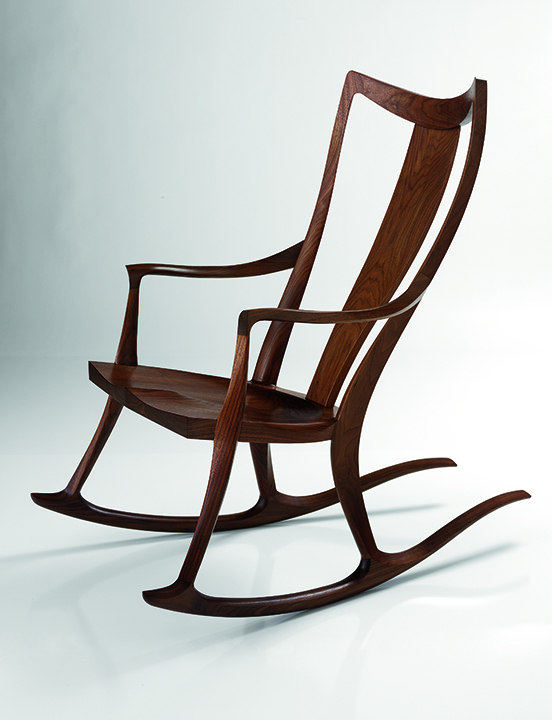 Built of dense, workable North American hardwoods, the Pasadena Rocker gives the illusion that it was freed from a single piece of wood. In the tradition of David Haig’s designs, the Pasadena Rocker exemplifies sublime form and sheer simplicity. The rocker is a quintessentially functional piece in the studio genre, with rollover edges and flowing joints. The result is a stand-alone sculptural piece that satisfies the visual senses while offering comfort and long service. The Pasadena Rocker’s form begins at its base, where twin rockers seem to grow into its hand-finished legs, which rise to form both the back and arms. The arms, in turn, flow up from the front to the back, where they meet with the crest. The crest of the rocker curves gently back to cradle its occupant, meeting in the center where a solid, ergonomically-shaped backstay drops to the seat back. The seat is a work of art in its own right, with a sculpted sitting surface that satisfies the visual senses while offering hours of relaxation. The Pasadena Rocker’s singular design is noticeable, making it a bright feature in nearly any interior environment. The rocker’s use of natural materials allows it to fit comfortably with both contemporary and traditional styles, and its durability ensures a lasting impression. The Pasadena Rocker’s distinctive design has earned recognition with a Design Magazine “Best of the Year” award in the Residential Seating category.